It exceeded expectations. Actually looks better than in pictures. 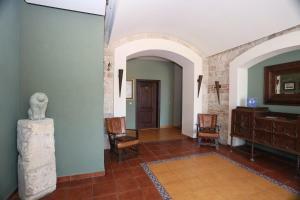 Is a new villa on the beach with studio and apartments. I will come back here. 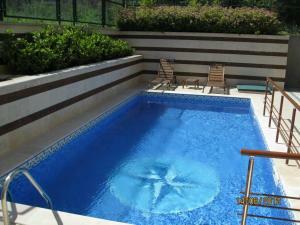 very close to the beach, huge balcony, large apartment and very good price. 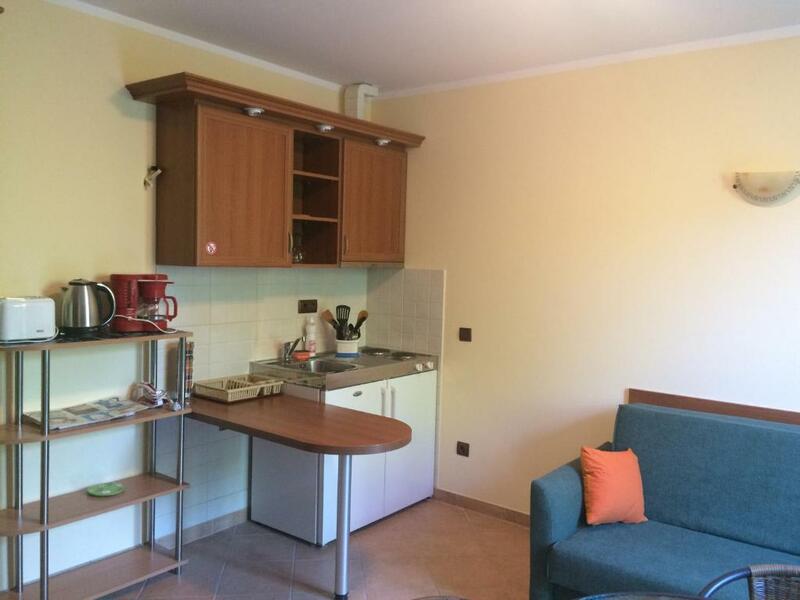 The apartment is nice, clean, with a small but practical kitchenette. The building has two elevetators for each side, no worries about the luggage. The beach is next to the hotel. Very quite, nice for families with small children. It was quiet ,the furniture was good and the beach was close. Close to the beach but also had an outdoor pool. Nice restaurants with great food nearby! Friendly staff, big apartment with 2 bedrooms and a living room, it had all the necessary things if you wanted to cook in the room. Wireless internet also. The apartment was literally big enough to accommodate at least two families. They expected us with the air conditioning on and the rooms were really clean. We even had a sea view from the living room and balcony. The position, near the beach, was also a big thumbs up and the old building are like surreal. Beautiful context. The bed was great. It is a good place to stay with your family. The bathroom and shower were very good. Very clean. Lock in a great price for Villa Allegra – rated 9 by recent guests! One of our top picks in Kavarna.This elegant holiday complex is 150 feet from the beach and close to 3 golf courses. Apartments at Villa Allegra include Mediterranean features, such as terracotta tiles, stone-exposed walls, hardwood floors and wrought-iron elements. 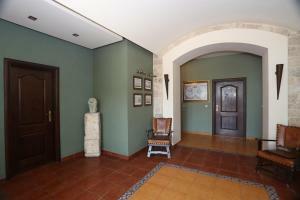 Every apartment has a living room and some feature a spacious entrance hall. The TVs have cable channels and free internet access. The kitchens come fully equipped with microwave and cooking utensils. The complex offers an outdoor pool, open-air barbecue area and children’s playground. There is also a small café bar and a laundry. 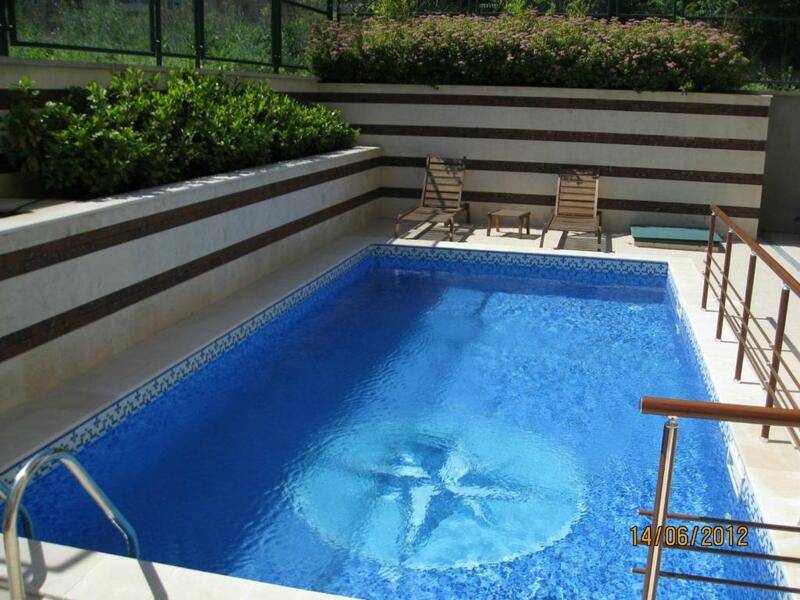 The Allegra is 14 mi from Tyulenovo and a 45-minute drive from Varna International Airport. The distance to Dobrich is 30 mi. 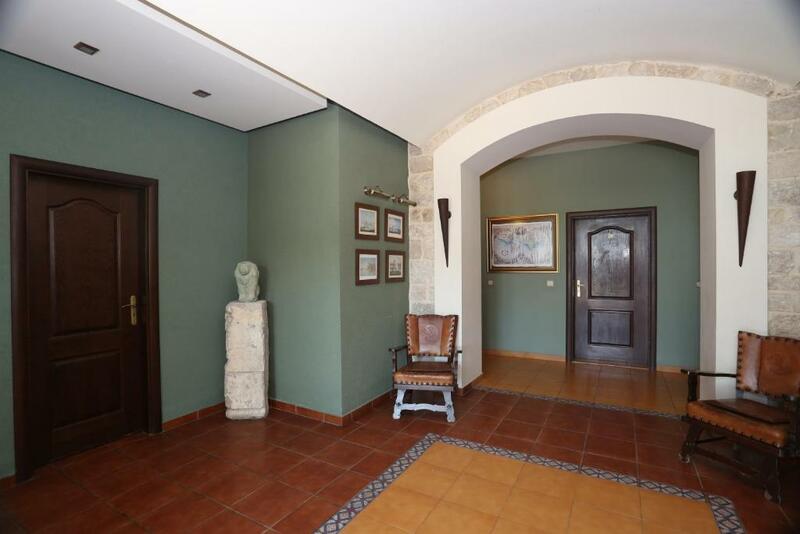 This property is also rated for the best value in Kavarna! Guests are getting more for their money when compared to other properties in this city. When would you like to stay at Villa Allegra? 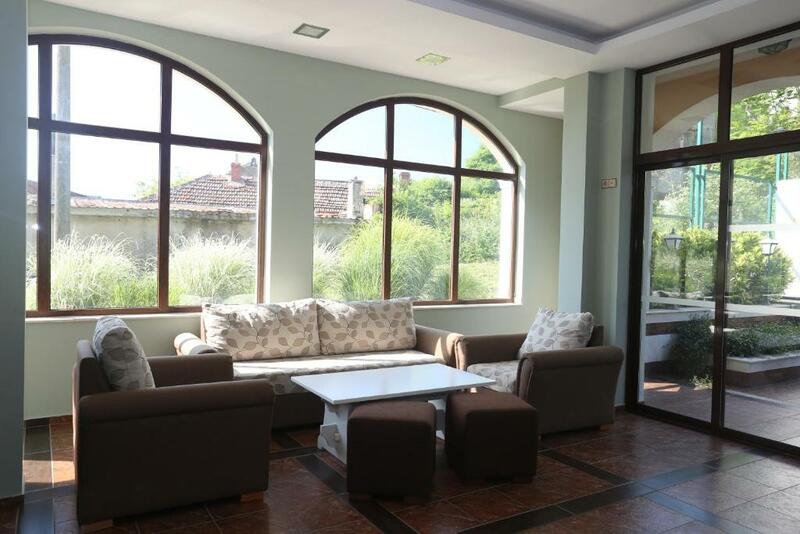 Apartments have a well-equipped kitchen, a living room with a dining area, cable TV, air conditioning and free WiFi. It also offers sea views. These apartments come with a well-equipped kitchenette, a living room with a dining area, 2 bedrooms and 2 bathrooms. They also feature a terrace and sea view. This apartment features 2 bedrooms, a kitchenette, a dining area, a seating area with a sofa and 2 bathrooms. This apartment features a kitchenette, a seating area, a dining area and a private bathroom. The apartment is located on the ground floor or on the top floor. Villa Allegra is your oasis of romance and love, your small escape from the reality. In recent years Kavarna got fame as the rock-music capital of Bulgaria. Every summer, Kavarna Rock Fest gathers famous musicians and thousands of rock fans from all over the world. Three golf courses in Kavarna vicinities offer unique panoramic views. Guests of Villa Allegra can visit Gary Player’s famous golf academy or enjoy numerous sports facilities such as tennis courts, basketball-, volleyball and football playgrounds. Village Tyulenovo is 15 km to the north from Kavarna. This is the gathering spot for lovers of extreme sports. Underwater caves reveal their incredible beauty to dedicated and experienced divers. This is also a good spot for fishing and underwater sports. If you have chosen to spend your summer holidays in Villa Allegra, you should by all means visit town Balchik and Albena resort, one of the most famous seaside resorts of Bulgaria. Balchik is famous with its lovely botanical garden and architectural complex The Palace, an ex residence of Romanian queen Maria, built in 1924. The incredible botanical garden was designed by Jules Jany, one of the most famous landscape designers of his time, designer of Tsarskoe Selo Park near St. Petersburg. Walking from the Palace along the seaside lane you can reach the marina of Balchik with its numerous restaurants offering fresh fish and typical local dishes. If you are connoisseur of culinary delights, you can visit Dalboka bay with its famous mussel farm and Balgarka restaurant, at only 50 m from Villa Allegra. House Rules Villa Allegra takes special requests – add in the next step! Up to two children under 2 years are charged BGN 4.89 per person per night in a crib. Villa Allegra accepts these cards and reserves the right to temporarily hold an amount prior to arrival. Please inform Villa Allegra of your expected arrival time in advance. You can use the Special Requests box when booking, or contact the property directly using the contact details in your confirmation. I booked a room with a double (queensize/kingsize) bed, yet we had 2 twin mattresses put next to each other. Not great for couples. The shower head was unusable... to little volume for too high pressure, can hurt and splashes everywhere. I didn't check for a "do not disturb" sign, but we also did not use a "please clean" sign. However, we were once knocked at the door and once been vacuumed while we were away. The lobby/relaxing room was closed and there is no coffee/bar/breakfast option available. But there are other options in the area and you also have a kitchenette in the studio. So I guess this can also be a plus :) The Villa is more like an apartment building, which can actually be nice if you want quiet. The cleaning can be improved, there were spider webs in hard to reach corners and also in the bathroom. And there was also dust on small ledges which are not necessarily in your view. One of the bedroom lamps was broken and you couldn't turn it on. Very nice suite that felt like home. We had a comfortable bed, a big living room with a small kitchen that had everything we needed to make breakfast and coffee. 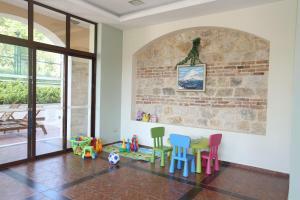 The property is a couple of meters away from the beach and has enough parking spaces around the building. They also have video surveillance cameras that capture the surroundings and a security guard at night so you don't need to worry about somebody breaking intro your car. Quiet spot with easy access to the beach and the sea. Ronnie James Dio memorial a little further to walk. Large comfortable room for two and washing machine downstairs so all good. Cute cats and dogs around too. Would be good if staff would talk a bit more English. Otherwise they are nice and friendly. the towels were not that clean, one of them had weird stains. Big rooms, nice furniture, silence, close to the beach. No additional sheets for the sofa (although we had pillows and topper) and a lot of dust under the bed. They had coffee filter, iron and ironing table, kettle, playground. Booked for 6 nights, no sheets changed, towels only once, no room cleaning during the 6 days, only garbage was pickef up every day. Nobody came to clean our room or at least take out the trash during our 2night stay. Please mount in the shower cabin a holder for shower gel,etc. Also could be a good idea to install a plastic curtain to block filling up the bathroom with water. There are two elevators. Each room has air conditioning.